High school sweethearts Jeffrey and Tammy Judge never thought their love story would bring them from Miami, Florida to Bossier City, Louisiana, but that’s exactly what happened – all thanks to the U.S. Air Force. When Jeffrey signed on as a jet mechanic his first assignment was at Tyndall Air Force Base in Panama City, Florida. After an eight-year stint in Alaska – and toward the end of Jeff’s Air Force career – his duties brought him to Barksdale Air Force Base where he planned to earn a military retirement. After that, the Judges were unsure of their future. Fate intervened in the form of a bakery for sale called The Wooden Spoon. Shortly before retiring, Jeffrey and Tammy bought the bakery unsure of the long-term efficacy of a bakery. But when the Wooden Spoon became profitable, Jeffrey had some more ideas. Growing up in Florida, Jeffrey worked at a sandwich shop. Sandwiches, he thought, might be a good addition to the bakery. So after retiring from the Air Force, Jeff went full time with Tammy at the Wooden Spoon producing baked goods, gift baskets, and making sandwiches. But the Judges weren’t finished with new ideas. Back in 2011, Jeffrey befriended Ben Hart and Ben Patillo (affectionately called “The Bens”), part owners of the Flying Heart Brewery in downtown Bossier City. Their shared love of beer brewing eventually evolved into an idea about pizza. Remembering his days in Alaska, Jeffrey noted that breweries often shared space with food vendors – most often pizza. And just like that, the idea for Wooden Spoon Pizza was born. Wooden Spoon Pizza now rents a space inside the Flying Heart Brewery. Their grand opening was October 27. The Judges, like others who have retired from the Air Force, see Bossier City with different eyes once they are in the private sector. Of the many things the Judges have found they like about Bossier City, one is the small-town feel with the big-city business opportunities. The Judges also have two daughters, Bre and Allison. For Jeff and Tammy, the economic environment of Bossier Parish made sense for a growing family as well as a growing business. Keeping with the small-town feel, their youngest daughter Bre has art on display right across the street from Wooden Spoon Pizza at the Bossier Arts Council. 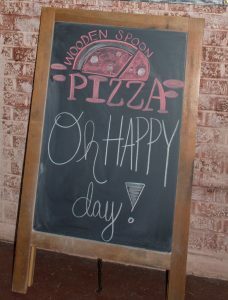 The Wooden Spoon Bakery and Pizza are family affairs – both Jeff and Tammy’s immediate family as well as Air Force family. Several of the their employees are connected to the Air Force or are former Airmen themselves. The Judges are also quick to point out that Tammy’s father was born in Bossier City, and though they don’t currently have any extended family here, it still makes their life journey feel circular. As for the future, Jeffrey is optimistic. Another Air Force couple, Jim and Shelly Taylor also retired to Bossier City. The Taylors are both from Texas. Shelly grew up in the big city of Austin and Jim hails from the tiny outpost of civilization in West Texas known as Marfa. Shortly after they were married, the Air Force whisked them away to California. After that it was England, Italy, Germany, Alaska and eventually Louisiana. During Jim’s time in the Air Force he served as a radar navigator onboard the B-52D and then traveled the world extensively with the Inspector General of the Air Force. Jim eventually retired as a Lieutenant Colonel after twenty-two years of service. The retirement plan, they said, was to go back to Texas and build a home on a lakefront lot in Carthage, Texas – land they already owned. But like the Judges, fate intervened. The Taylors stayed in Bossier Parish for many of the same reasons as the Judges – a close-knit family, quality schools, and a solid community foundation. The Taylors’ abiding philosophy in their transient years in the Air Force was “home is where the family is.” And now the family was in Bossier City – not just their two children Heather and Wes – but many friends as well. And so they eyed their future in Shreveport/Bossier. At age forty Shelly received a Bachelors degree from LSUS. Jim went on to several different jobs, including eight years as an American and Louisiana history teacher. He sees many of his former students in the community. Shelly recently retired as President and Chief Executive Officer of the Louisiana Association for the Blind. Their activities include spending time with their grandkids, cheering on the Dallas Cowboys and going to dinner every Thursday night at their favorite Bossier City restaurant – 2Johns. All these years later with the kids grow and gone, the Taylors reflect on why they still live in Bossier Parish. Like others the conclusion is simple: it’s home. And while the list of positive attributes is obvious, there’s only one thing the native Texans don’t like about Bossier City. “I don’t like when they don’t air the Cowboys games!” Jim joked.